We are in the process of picking new windows for the second floor. There are two windows to be replaced: one on each end of the house. These are the major sources of light on the second floor, other than the dormer (which lights the hallway) and the solar tube (which will light the master bathroom). The existing windows are double hung, with each sash having about 26″ by 24″ of glass. They fit into rough openings that are about 4″ too wide for a modern window, because the old windows have sash weights fit between the jams and the studs. We see ourselves as having two options: 1.) Install a new window which exactly matches the existing in terms of glass area (and furrow out the studs to fit). 2.) Install a larger window which takes advantage of the 4″ larger rough opening, sized to be taller as well to maintain the proportion. The following picture shows the existing window on the right, and a mock-up of the proposed larger window on the left. The larger window is 4″ wider and 3″ taller. Consistency – There are presently 6 windows of this size in the house. Two on each end wall (the other in the photo above is hid by the tree), and two framing the big window on the front. Do we replace all of these with the larger window? We can’t for the front windows .. it will alter the proportions and run the trim together. So this will introduce a new window size in two or four of the 6 locations. Cost – Larger windows are a little more expensive. Not by much, proportionally, but some. Balance – Does the window look too dominating in the altered photo? Does the original size seems a little lost on the gable end? Insulation – Bigger windows are colder than smaller windows. Not by much, proportionally, but some. 7 Responses to Is bigger better? Hi Robin & Lee – I showed Randy your blog – he & I both say to put in the larger window to replace as many of the other windows as you can, as long as it isn’t right beside a smaller window. The larger window does not look dominating in the altered photo you showed, it’s not much different looking, really, than the smaller window. As long as you don’t think introducing a new window size will affect the appearance of the house with the other windows or the future window treatments you plan on installing inside. Good luck with your decision! I love light so I would absolutely prefer the larger window. I agree with Lynn though, visually, there isn’t a lot of difference between the two photos. Well, I had to look at both pictures carefully to even see the size difference in the windows, so I’d say go with the larger one. They look pretty much the same to me. Well, the larger’s seem to have it. We decided to go with the larger window for the sake of more light. We ordered the first of them on Wednesday. In typically ironic fashion, this window is 62% larger than the dormer window, but only cost 21% more. 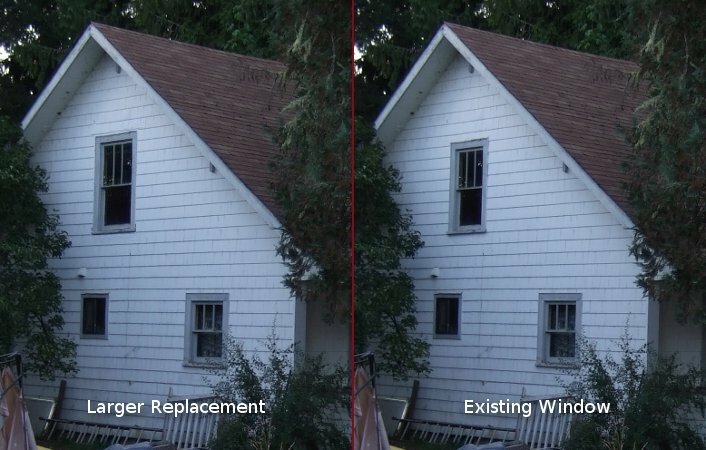 In the bad news department, the Marvin rep pointed out that the window is rated for a U value of 0.31, and thus does not qualify for the energy efficiency upgrade tax credit. The cut off for the tax credit is 0.30. The window would be U 0.29 without the true-divided-light spacer bars, but Robin is a big fan of those, so we end up paying for them twice. Having a hard cutoff for the tax credit is kind of dumb, since people with those horrible 70s aluminum frame windows with a U factor of 1.00 or worse would benefit just as much from a 0.31 window as a 0.30. For that matter, the government standards require a SHGC of 0.30 or lower as well, which would be totally wrong if you were updating the windows on a passive solar house.